Russian fashion sense is truly a thing to bear witness to. Before coming to Saint Petersburg, I had only heard that they “dress a bit nicer” than we do in America. I had no idea what I was in for. The women here dress in a rotation that often consists of some sort of patterned or leather jacket, an array of blouses and unique tees, tapered jean cuts or dress pants, heels or boots, and a detailed leather handbag by the European designer of the times to top it all off. However, it’s not just the ladies who dress to the nines here – even the guys don their carefully curated wardrobes mixed with cool leather pieces and upscale menswear as their everyday look of choice. 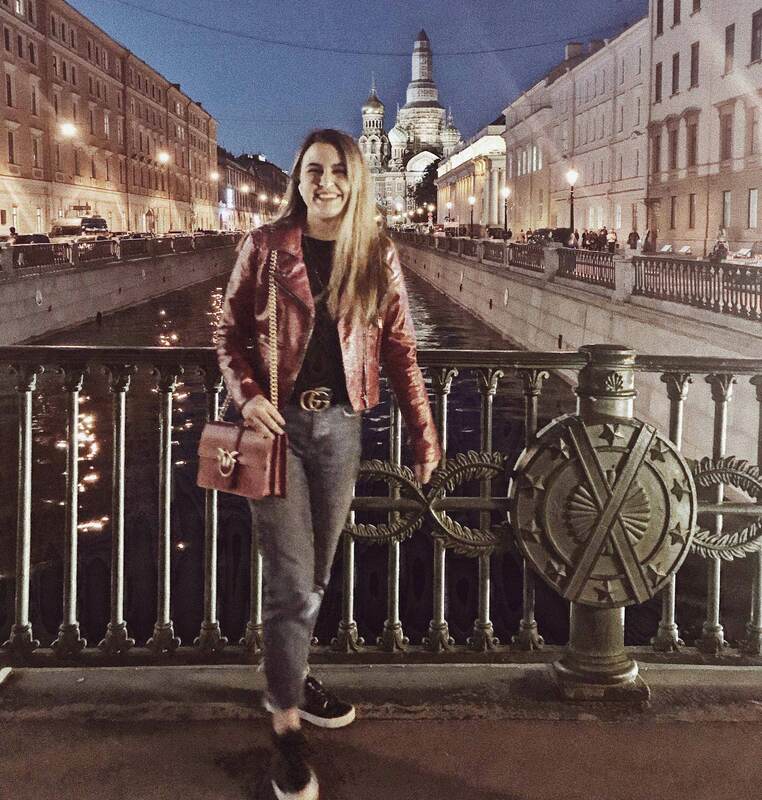 It may sound like there is monotony in the Russian style, but I find it to be the opposite: yes, there are staple pieces, such as a good black leather jacket, but everyone adds their own unique twist to their outfit each day. There is definitely a very tangible pressure to dress up here, but I am not completely averse to it. It feels nice to put effort into your appearance on a regular basis, and know that each day is a new chance to express a different facet of yourself to the world, rather than throwing on things that you aren’t particularly excited to wear. Since I’ve been here, I have definitely noticed my own sense of style changing. Wearing my American garb has given me away many times, and I quickly learned to adapt. While my goal isn’t to completely mask my identity, I don’t want to turn a blind eye to the culture here either. My old t-shirts and jeans just did not work anymore. I now have my own selection of two different leather jackets, a black blazer, a leopard print (!) blazer, combat boots, and so-on and so-forth. I find the attention to style here commendable and something to admire and emulate to a degree. My sense of fashion has gotten so much braver, and I find it less terrifying to truly express myself through my style choices than I had before. Experimenting with style doesn’t have to mean reinventing yourself into something unrecognizable. It can even just be adding a fun new accessory, like a bright scarf or a big fuzzy teddy coat that you might not have been brave enough to wear in the past! There is going to be some definite reverse culture shock for me when I come back to America and see that I’m wearing blazers and boots to class while others are wearing sweatpants and tennis shoes! However, I definitely think that this is a piece of Russia that I will forever be grateful to have taken home with me. Russia has taught me to express myself despite what others around me may think of me, and for that I will always look upon my time here with fondness for my newfound confidence in my style.